For a long list of Utah Sierra Club hikes and outings click HERE. 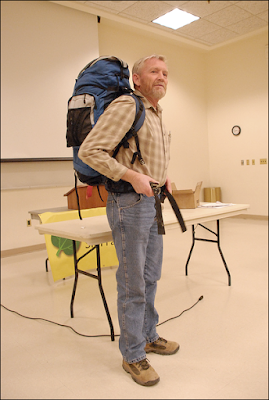 Bob Own (left) who did our "Art of Backpacking" presentation in February, is proposing several fun backpack outings for us. Here they are! If you go, you will need to sign a release for so please let Bob Owen know asap if you are planning to go. Thanks. PLEASE NOTE: These backpacking trips listed below are not UVSF outings but are opportunities for UVSF members and the public to enjoy nature first hand with a good friend of the UVSF, Bob Owen. HIGH UINTAS, Fri-Sun, August 22 through 24th. We will meet at the Highline trailhead above Mirror Lake and follow the Highline Trail into the designated wilderness. Day one will take us to Pinto Lake to set up camp. Day two will be fun hiking without packs along different trails to other lakes. Fishing and swimming would be an option as we enjoy the beautiful environment. Day three would be packing up and hiking out. The hike is not strenuous but is at about 10,000 elevation. FENCE CANYON/ EGYPT TH, Fri-Sun, September 12 through 14. If participants wish, we could spend an extra day at the river and come home Monday. Day one we will meet at Devils Garden and then hike a few miles down the slickrock to the Escalante River to set up camp near a spring (but still need to filter water). Day two will be hiking without packs a few miles down river which requires wading. We will have plenty of time to spend at the Golden Throne, which is a photographers paradise. The final day will be moderately strenuous hiking back up the slickrock. LITTLE DEATH HOLLOW, Fri- Sun, Sept. 26 through 28. Day one we will meet in Boulder and follow the scenic Burr Trail with a stop or two to hike a little without packs in some of the best sandstone hiking in Utah. We will have a 13 mile dirt road to reach the trailhead where we will camp. Day two will be hiking down Little Death Hollow which has several miles of narrows and slots with a dozen or so choke stones to negotiate over, around or under. Perhaps a little mud and a pool or two to wade. We will camp on the sand under some beautiful Fremont Cottonwood trees. Day three we will pass by a mother lode of black petrified wood as we hike out Wolverine Canyon which has some more narrows. Perhaps a 5 hour hike out. This is not a strenuous hike (total 14 miles). GRAND CANYON, Thur-Sun, October 16 through 19. We will need to travel and camp in the area of the trailhead on Wednesday night. Day one will be the big drop to some level sandstone, then another drop to Surprise Valley where we will set up camp for the trip. Day two will be a third drop past the roaring Thunder Falls and down the resulting river to Tapeats River and on to the Colorado, then return to camp. Day three will be hiking the other direction to Deer Creek to enjoy the falls and beautiful green canyon. It will still be summer there. Day four will be the very strenuous hike out. About these hikes: There is no cost other than about $25 permit fee for the Grand Canyon. All we request is a love for nature and a respect for the environment and willingness to abide the rules the Park Service has set, which we will discuss the first day of each trip. None of these trips have exposure and no ropes are needed. There is usually a 12 person limit. Fires are usually restricted so you will need a little propane stove and water filter. Get in shape ahead of time for these trips. These trips will not be a foot race to the other end, but rather a slow pace to enjoy beautiful nature. "Clean Coal"...? Don't think so.